The Kickapoo Department of Environmental Programs (KDEP) strives to provide effective environmental programs that promote protection of the environment and human health with respect to surface water, drinking water, air, solid waste, brownfields, underground storage tanks, hazardous waste, emergency response, environmental justice, pesticides, and environmental planning projects. The mission of the Kickapoo Tribe is to protect and manage the reservation environment for the jurisdictional and/or service area of the Kickapoo Tribe of Oklahoma. In order to increase protection of its environment, the Kickapoo Tribe established the Kickapoo Department of Environmental Programs (KDEP) in December of 1997. The KDEP is responsible for identifying environmental problems and developing prevention and remediation strategies. To accomplish this mission, the KDEP will adhere to quality assurance activities in order to ensure that all decisions are based on environmental data that is scientifically valid, precise, accurate, complete, representative, comparable, and legally defensible. KDEP will strive to incorporate cultural needs, which is the tradition and heritage of the Kickapoo people into all documents produced for the preservation of the Tribe. The KDEP manages the Secondary Administration Complex public water supply, and provides technical assistance to operators of the Tribe’s other public water supply systems. The KDEP also applied for and received funding for a water line extension to Frye Road. This project was funded by EPA and managed by Indian Health Service. The Secondary Complex System (PWS No. 062004173) is a small system consisting of a single metered well and a small distribution system. It was constructed during the late 1960s or early 1970s. The Secondary Complex facilities include the Department of Environmental Programs, Education Department, Tag Department, Maintenance building, and the gymnasium. The supply well is approximately 70 feet deep with 6-inch-diameter casing. 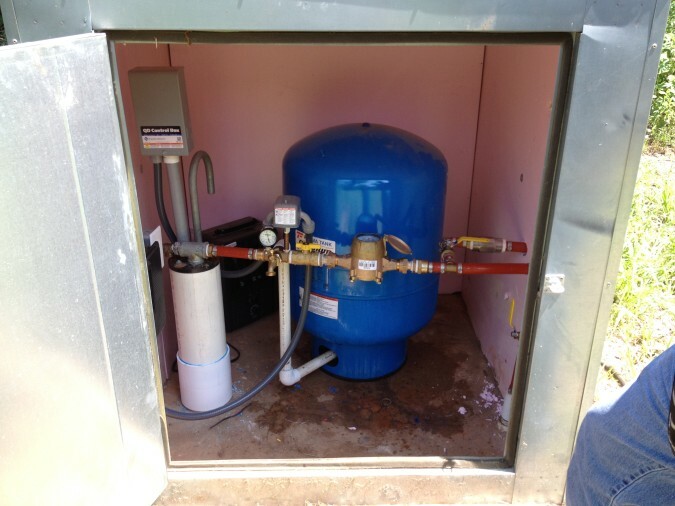 (image below)It is equipped with a 1-hp submersible pump that discharges (1-inch-diameter pipe) to a 52-gallon hydropneumatic (pressure) tank. The distribution system consists of short lengths (less than 100 feet) of 1-inch- and 2-inch-diameter pipes. This system is tested monthly for bacteria coliforms and other inorganic/organic parameters as required by USEPA. An independent laboratory performs some of the our testing analysis. All test results can be retrieved by completing our request form please. The KDEP duties are both administrative and technical in nature. It is responsible for managing all of the environmental programs and identifying environmental problems of the Tribe. The KDEP is also responsible for developing draft plans, codes, policies and regulation for the control, mitigation, and prevention of these problems. The KDEP is almost 100% funded by grants from federal agencies, primarily the Environmental Protection Agency (EPA). Because most of our funding comes from EPA, the majority of projects we undertake benefit the community as a whole. 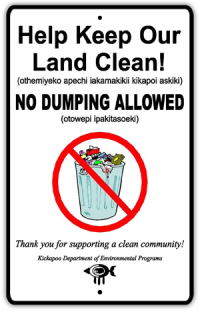 Community -wide projects include surface water monitoring, providing roll-offs for annual community cleanup events, and educational opportunities for children. We also offer radon testing to individuals and provide information on a variety of environmental topics including testing and disinfecting residential wells, proper handling and disposal of pesticides, water conservation, and indoor air quality. Due to funding constraints, there are some services our department is unable to provide. Please contact our office for information on environmental topics or with environmental complaint or concerns.